Speed and stunts galore are the trademarks of the Ryukyu Dragon pro-wresling shows. Ryukyu Dragon Pro Wrestling, the only pro-wrestling team on Okinawa, is celebrating the group’s 3rd anniversary on Sunday, Apr. 24, by staging a special show on their home arena on the third floor of Navel Kadena shopping mall. Gurukunmask won a champion belt in February. 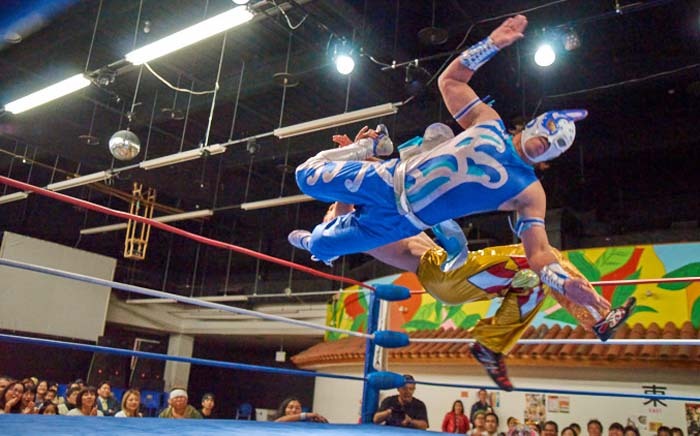 In addition to regular shows on their home arena, the team has performed in shows at a wide variety of events on the island with their slogan, “Dream, Courage, Excitement and Smile by Pro-wrestling.” They have also been very active in charity events and often brought their entertainment to orphanages and seniors’ homes. The team is known for the Okinawa-themed names of the team wrestlers that include such characters as gurukun (local fish), tida (sun), and typhoon. The highlight of the anniversary event is a match between Gurukun Mask and Churaumi Saver. In February, Gurukun Mask beat Billy Ken Kid, a popular pro-wrestler from Osaka, and won the champion belt. Other matches at the event are Tida Heat vs. Typhoon. J. Rick; Takashi Sasaki (FREEDOMS) vs. Ultra Soki; Ryukyu-Dog Dino and Shuri Joe vs. Rekka and Touyu; Hibiscus Mii vs. Hoshi Hamuko (Ice Ribbon); and Toshiyuki Sakuda (from Dai Nihon Pro-wrestling) vs. Hijya Kidman. The anniversary event takes place on Sunday, Apr. 24th. The doors at Navel Kadena Arena open at 13:00, and the rumble starts at 14:00. Advance tickets for general, non-reserved seats cost ¥3,000; reserved seats are ¥4,000 (but only a few are left); high school student tickets are ¥2,000; junior high school student tickets ¥1,000; and elementary school students pay ¥500. Tickets for disabled and elderly people are ¥2,000 in advance. All tickets are ¥500 more at door. Tickets are sold at Ryukyu Dragon Pro-wrestling, tel. 098-956-5500 or email info@rd-pw.com. They are also available through FamilyMart convenience store e-plus. Japan Update will raffle three pairs of tickets to the anniversary event. To take part, go to JU facebook page and send a message.